While big parties are failing to join hands for the retaking of Tallinn from Edgar Savisaar, their tiny cousins cannot seem to forge a common front to fight the «parliamentary fixtures». 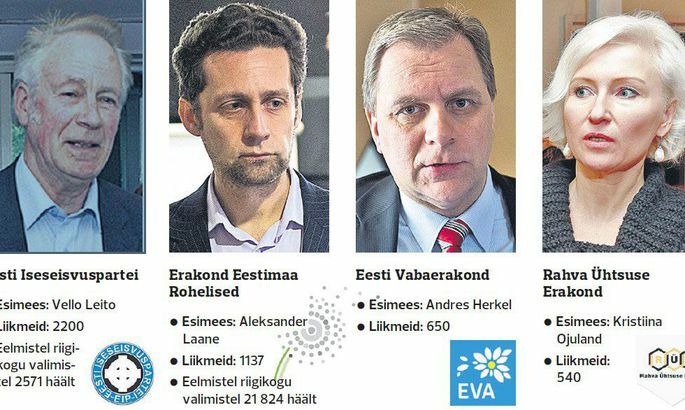 The biggest little one amongst the outside-of-Riigikogu parties, Conservative People’s Party of Estonia (EKRE), proposed to Party of People’s Unity (RÜE), Estonian Free Party (EVA), Estonian Greens, and Independence Party (EIP) to tackle the presently big parties together, at the March elections. The Kristiina Ojuland led RÜE at least reacted, the others – says EKRE board member Martin Helme – are «embarrassingly reticent». At the moment, EKRE is compiling a list, seeking for money and is on October 11th convening for a pre-elections conference. By then, they will probably have completed their election programme. At the local elections, EKRE harvested 8,337 votes i.e. 1.3 percent of those who voted. At that, they are active and have a simple message: this is an all-Estonians party which stands for the interests of every Estonian. And that not in Estonia alone. Finland having become the other homeland for numerous Estonians, on October 20th EKRE is establishing a separate Estonians’ department in Helsinki. RÜE deems it important to cut public sector costs and to carry out a sweeping state and local government reform. Also, a main message of the party’s is social security. «Simply put: after payday, people might have a week’s worth of savings left over. People’s living standard and the feeling of social security must rise,» said RÜE head Ms Ojuland. In addition to that, RÜE desires to cut Riigikogu membership from 101 down to 71. «Both the state reform idea and the cutting of the Riigikogu – we can come out with these. The old parties cannot [do that], as they are dependent on their food chain,» noted Ms Ojuland. Also, RÜE thinks it important to restrict the Estonian taxpayer money «flight» via the so-called foreign banks, by their hundreds and millions of euros. «This has to be stopped, that the people’s money is so brutally peculated out of the country,» said Ms Ojuland. On September 22nd, RÜE also initiated a pan-Estonian collection of signatures in order to ban public drinking. Riigikogu-aspirations are also alive and well at Independence Party, pocketing 2,571 votes at previous elections. Its chief Vello Leito, however, assured us they are being very active. Even so, he remained rather secretive regarding plans for the future, while hinting at dramatic openings. «We have a clear niche and it cannot go anywhere. We are wishing for an independent Estonia, not a republic of the European Union – a federation union – like we currently are. No-one dares to say that openly, but that’s the way it is,» said Mr Leito. We’re not too independent now? «Wait a moment – did you ask that in all sincerity? !» Yes. «You must know, then, that the second question in the EU referendum [to join or not to join – edit] nullified the Estonian constitution. In it, it is clearly stated that European Union justice is above the Estonian constitution. Which means that, automatically, the Estonian constitution ceased to be valid altogether,» said Mr Leito, casting a little light on the direction they are about to move while campaigning. The Greens leader Aleksander Laane named the key to get into Riigikogu: diversity is the cornerstone of survival and flexibility. According to Mr Laane, the current situation in world politics is largely due to humanity not being independent from energy, and the raw materials coming from countries like Russia and other non-democratic nations wrecks any logic for the planet to survive. «Thankfully, the understanding is rather rapidly spreading that we must come to a totally different economic situation. This is the issue of our survival and it takes long-term decisions,» says the chief of Greens. «Our time-horizon edges on from elections to elections, but in reality we would need to look 20–30 years forward. Energy issues need to be tackled; Denmark, for instance, took that up in the 1960ies. We may catch up, but we will have to try hard. We need to think big, look at what’s been accomplished in the world, and not cling to what’s been done here,» he added. The Free Party, established on September 27th, desires and promises exit from the comfort zone. On the eve of the party being founder, its chairman Andres Herkel announced they’d be pushing three issues: democracy, decentralisation of power, and improvement of situation for small enterprise. The Free Party claims to have a clear programme and points of view. At their estimation, Estonia is in need of a state reform – local governments need to be bigger and also more independent. In the situation where tens of thousands of Estonians have departed abroad and their swift return is not realistic, ways must be discovered to help tie them to Estonia to a greater degree. «We propose Estonians Abroad electoral district,» said Mr Herkel. The Free Party wishes to create conditions for cooperative-type entrepreneurship, make it more flexible for private persons to be in business, and strive towards making local governments more concerned for the development of business. The above, however, does not complete the list of political parties in Estonia. The Estonian United Left Party, membership at almost 2,000, will decide on October 18th if it will run – at the party’s congress held after a two year pause. In addition to them, a close to 1,000 members Estonian Liberty Party – Farmers’ Assembly is registered in Estonia, but they haven’t taken part of the recent elections. Next to parties, there’s room left over for single candidates. These can sign up starting December and the deadline is in mid-January. Riigikogu elections are held on March 1st.